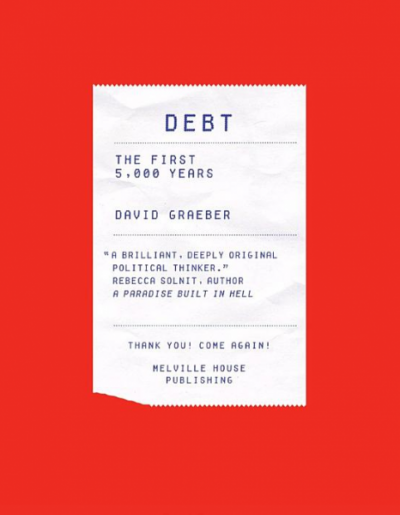 Recently, I read a book by David Graeber entitled “Debt”. At the beginning of the book, the author recalled a conversation where he told an acquaintance that he was advocating the abolishment of Third World debts. Her replied was: “But… they’d borrowed the money! Surely one has to pay one’s debt”. Over a New Year’s Eve dinner this year, someone at our table said the same thing about PTPTN study loan in a friendly discussion about Pakatan Rakyat’s alternative policy. Somehow, the conversation led to a similar impasse: surely one has to pay one’s debt. I will not attempt to answer the question (yet), but allow me to challenge its assumption which I believe underlies our relationship with each other in society. This sort of questions is in the category of “who owes whom what?”. In other words, it deals with responsibilities and rights. It assumes that one party will have some kind of duty towards the others in exchange for some privilege extended. Seems like a fair equation, but is it? The problem with this equation is that it assumes that both parties in the relationship are equal. In reality, this is never the case. The bargaining power of one party depends very much on what is the cost of that party not agreeing to the arrangement which both parties seek to achieve. Those with larger capital, with better technology, with better access to various means and resources will inevitably have greater bargaining power against those who didn’t or those who have lesser. What about the obligation of the creditor? As such, the onus of responsibility is often put on those in weaker bargaining positions. This is best pictured in the relationship between the creditor and debtor above. It is usually about the moral obligation of the debtor. But what about the moral obligation of the creditor? From another perspective, this social relationship puts the stronger party as the rule-setter of the game. You either play by my rules or you are out. Those with larger chips have the upper hand, they unilaterally set the agenda and become “mainstream”. Their game is accepted as “reality” which cannot be questioned. Hence if something is undesirable within this reality, we are told to change ourselves, not change the accepted reality. Let me offer another scenario. How often have we heard statements such as “if you think it’s too expensive, you have the choice not to buy”. The argument is always against the people, the consumers. We are told the responsibility is on us to decide whether or not to purchase, not on the corporations to reduce their price. For the sake of argument, if the product in question is a Birkin handbag, perhaps such a statement is justifiable. But what if it is for a medical treatment? Or a life-saving drug? Does the consumer in question now have a choice “not to buy”? In this case, can the patient exercise her responsibility to choose “not to buy”? What about the responsibility of the corporations producing these medicines? Ubah! or Ubah gaya hidup? We are thus accustomed to a culture of not questioning the system but instead are asked to change our response towards it. But the question remains, why must we accept a reality where the majority of the people are helpless just because they do not possess the economic power to produce or to work with powerful parties such as the government to maintain such an unfair “reality”. Instead of allowing us to question the existing structure, we are asked to ubah gaya hidup — change our lifestyle. Perhaps another good illustration of this lopsided social equation is between the people and the government. The accepted reality seems to require the people’s obedience to their government, to be loyal to their leaders, and in the case of Malaysia, we are even asked to be grateful. In other words, the people have a moral obligation, a responsibility towards their government. And we are often reminded of this obligation, sometimes even blurring the line between the love for one’s country and the relationship with the government of the day. We are told to defend the government as if that means defending our country and the national values we all cherished. But what about the moral obligation of the government? Is the government merely responsible to build hospitals and roads? What about good governance and anti-corruption? What about justice and fairness? What about human rights and welfare? Should we be thankful for police stations and not demand professionalism in the police force? Should we be thankful for hospitals and not ask for affordable quality healthcare? Should we be thankful for roads and other public infrastructure projects and not compel our government to come clean on public contracts and spending? In the present accepted reality, where the government is the stronger bargaining party, when things go wrong the people are, alas, asked to change their lifestyle (and not the government?). “Where to start? I could have begun by explaining how these loans had originally been taken out by unelected dictators who placed most of it directly in their Swiss bank accounts… Or to think about how many of these poor countries had actually already paid back what they’d borrowed three or four times now, but that through the miracle of compound interest, it still hadn’t made a significant dent in the principal. Yes, PTPTN may be different from loans to dictators of Third World countries. But think about it; does a student have a choice in the first place not to make such loans? We are told that those below 21 years old cannot vote, and university students are too young to be involved in politics, yet on the other hand they are compelled to take up loans of up RM30,000 just because their parents could not afford to send them to universities, even supposedly government-funded ones. When necessities such as medicines and education are commodified to be like Birkin bags, just like the patient who has no option but to buy expensive life-saving medicines, students have no choice but to take up PTPTN or other study loans. One cannot choose if what one is presented is only an illusion of choice. Why do I write this article? Because all of us in Malaysia know that we are days to one of the most historic elections in our country. Many hope for a real change this time. But does “change” merely mean changing the guards? The problem of our country is not merely political parties, but rather it is more subtle and systemic; one involving the underlying values with which we deal with others in society. A real change therefore must include reworking the social equation which renders most people helpless against the big players. Yes, change we can and change we must because the present government is not able to redo the maths of this unfair social equation — they are too deeply entrenched in it, both as providing the context for such system to flourish and as a key player in this game. Which is why, ultimately I see the Pakatan Rakyat’s manifesto as a game-changer. The promises of Pakatan Rakyat in regards to PTPTN and free university education are not merely to pardon delinquent debtors. Rather in the larger scheme of things, it should be seen as questioning the status quo which is no longer sufficient to address the present challenges of living together in a society. The Pakatan Rakyat manifesto seeks to re-examine and re-do the maths. Doing more of the same thing is just not enough anymore — we need a total rethinking of the system. It is worth noting that Pakatan Rakyat uses the First Hundred Days model as part of its election campaign. This is reminiscence of Franklin Delano Roosevelt, more popularly known as FDR, President of the US during the Great Depression and the Second World War. FDR was the first president to popularise the term “First Hundred Days” when beginning with his inauguration, he launched a series of programmes to deliver his country out of one of the worst social and economic collapses in history. His programmes, collectively dubbed the “New Deal”, were meant to shift the social equation, to help, in FDR’s own words, “the forgotten man at the bottom of the economic pyramid”. Doing more of the same was just not enough anymore. Dr. Raymond Moley, FDR’s key adviser, reminded him that his campaign should present a clear alternative, “not a choice between two names for the same reactionary doctrine”. In other words, FDR had to redo the maths. His opponent, President Herbert Hoover, himself noted that the 1932 presidential campaign, which FDR won against Hoover, was “not a contest between two men [but] between two philosophies of government”. The year 1932 for the US is 2013 for Malaysia.